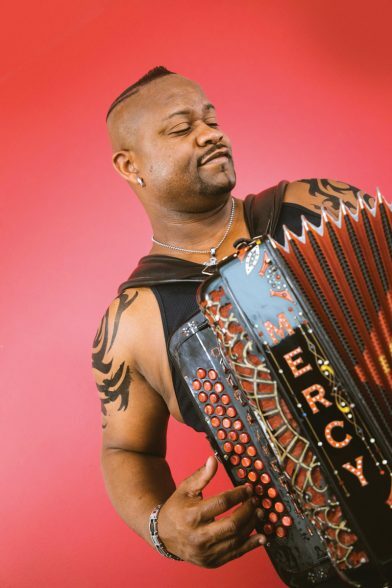 Whenever Dwayne, 40, takes center stage leading his band, the Zydeco Hellraisers, he continues to display the same kind of tenacity and drive he exhibited as a youngster in his pursuit of his childhood dream of becoming a force in zydeco music. Today, he’s a powerhouse accordion player and emotionally strong vocalist who just doesn’t ever let up, pushing and pulling at his three-row button accordion, the same style of instrument his father used to play to maximum effect. Dwayne’s always-exuberant attack on the accordion is heard on the very first cut, “Andree Jones,” off his red-hot new album, Bon Ton. It’s one of 12 of his original songs, and acts as an introduction to Dwayne’s stylistic approach that is rooted in the old school style of zydeco perfected by his father and Clifton Chenier, the King of Zydeco, yet his solos speak of today. The lyrics, which describe the main character—“He tells a lie every day of the week”—are hilarious, in keeping with the comedic elements that have often been staples of zydeco music. A personable performer, Dwayne delivers this tune as well as his “Give Me Want I Want,” on which he tells his girl, “Don’t give me your crawfish if it ain’t got no pepper,” with a certain honest charm and a wink. “I was much younger than everybody else,” says Dwayne, explaining that, in his early years, there were just two of his brothers at home, rubboard player David, now known as Rockin’ Dopsie Jr., and accordionist Anthony. The rest of his siblings, including drummer Alton, nicknamed Tiger, had already left. At age six, Dwayne was playing rubboard, and made several appearances with his father’s band, Rockin’ Dopsie and the Zydeco Twisters. By the time he was seven, he’d already taken up the accordion. “My father had an accordion that he let Anthony and me play,” says Dwayne, who upon arriving home from school would jump right on it. “We had a big camcorder and a tripod and I’d record myself for five hours playing and go back and watch it. That’s what got my motivation.” He remembers thinking to himself that he wasn’t playing it right and that he needed to do better. 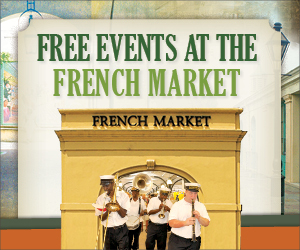 Being fluent in Creole French, Dwayne helps keep the language of his ancestors alive by incorporating it in his music. On the two-step number “Hey La Ba,” off the new release, he starts out singing in Creole French and later he translates (we assume) the lyrics into English. He mixes it up similarly on the waltz-time “Everybody Talking,” from his 2017 Grammy-nominated album Top of the Mountain, where he also sings “Ma ti femme” entirely in Creole French. Dwayne’s only beef is that there are now so few people that he can talk to in the language that he loves. “When I go home and visit my mom, we’ll speak French,” he says, adding that he also has conversations with some of the older people in his hometown who are shocked that he remains fluent in the language. “My brothers understand more than they speak [it],” he adds. That same year, Dwayne formed his own band and initially named it Dwayne Dopsie and the Rollers. While performing at Bourbon Street’s La Strada club, a man came up to the bandstand and said, “Man, you guys are really raising hell—you’re hell raisers!” “I thought, ‘ding’ that’s it.’” From then on, the group has very appropriately been called Dwayne Dopsie and the Zydeco Hellraisers. Just an aside… Dwayne’s father, Alton Rubin, embraced the name Dopsie years ago, a moniker carried on by his musical sons. Dwayne tells the story that a guy from Chicago, who was known as Dopsie, would come to Lafayette and he was hailed as a great dancer, especially doing the jitterbug. Alton started imitating him and folks began calling him Lil Dopsie. That evolved into Good Rockin’ Dopsie, which eventually led to the shortened version, Rockin’ Dospie. His first band, called Rockin’ Dopsie & the Zydeco Twisters, is now led by his son, David “Rockin Dopsie Jr.” on rubboard and vocals. Bourbon Street clubs were central to Dwayne’s career and development as an artist, and also played an important role in establishing connections with audiences and business people from around the country and the world. Zydeco was a rarity on the famous street, and for many visitors it was the first time experiencing the style. Dwayne’s powerful and energized shows certainly made for a dynamic introduction to zydeco music. He and his Hellraisers played on Bourbon until Hurricane Katrina hit in 2005, when he headed to Baton Rouge and the band did some touring. After getting messages urging him to come back to the French Quarter, he returned to play at the Old Opera House. That Bourbon Street venue became too small for the large crowds the band drew, so the party moved just down the block to the larger Krazy Korner club. The Hellraisers’ last show on “the street” was in 2014. Dwayne felt ready to move on. 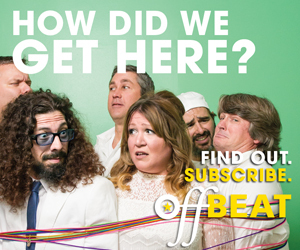 “I had enough contacts and notoriety from people from out-of-town,” remembers Dwayne, “so we got on the road and we started doing more and more festivals and concerts.” The band now also has the opportunity to play a variety of club dates in New Orleans at spots like d.b.a., the Ace and, of course, at the French Quarter Festival and the Jazz & Heritage Festival. Last year at the Cajun-Zydeco Festival held in Armstrong Park, Dwayne and the Hellraisers were joined by his brothers, David, Anthony and Alton. The show appeared to be as much fun for the guys on stage as it was for the excited audience. The siblings, backed by the Hellraisers, all shared a stage again last March to pay tribute to their father. It was a first of its kind event, celebrating Alton “Rockin’ Dopsie” Rubin in the family’s hometown of Lafayette. At 40, Dwayne is at the top of his game as a musician and is now celebrating the Hellraisers’ 20th anniversary and the release of his tenth album. It might be surprising to some that he credits his years gigging on Bourbon Street for preparing him for his rise. When Dwayne, a very muscular man with eye-popping biceps, refers to Bourbon Street clubs as his “gym,” he means it more literally than one would think. Despite his strapping physique, Dwayne does not and never did work out—no bench presses, lifts, treadmills, pushups, nothing. He credits playing the accordion, the pressure to open it and push it closed(particularly during those long, strenuous nights on Bourbon) for the size of his arms. Needless to say, the always-in-action Dwayne Dopsie was and is a vision to watch perform. He doesn’t mess around or take anything for granted. He’s full on as an accordionist, vocalist, and showman. Visually, he’s also always been uniquely stylish. Presently, Dwayne sports a very clean and precisely designed hairstyle that he describes as his “Native American look.” At one time, a similar coiffeur included a ponytail. Many folks will surely remember when Dwayne went through a period of time when he wore slightly bizarre blue contact lenses. When he appeared on both “CBS This Morning” and NBC’s “Good Morning America” after winning the accordion contest, millions of people saw Dwayne sporting the blue contacts. It’s likely that most television viewers and those in the audience at his live shows figured Dwayne was simply just trying to draw attention to himself. Surprisingly, his intent held a much deeper and significant meaning. 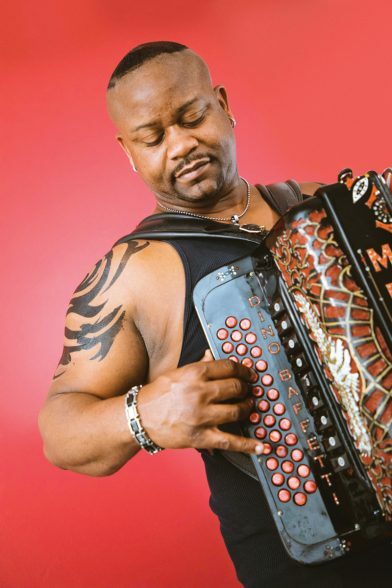 In keeping with the zydeco tradition of his father and Clifton Chenier, Dwayne is noted for having a strong rubboard player out front with him. On the new album, the man working hard on the rhythms is Paul Lafleur. Dwayne’s father’s influence, which remains a part of most everything he does, shines brightly not only when he’s playing straight-up zydeco, but when he incorporates the blues, as he does on two lovely cuts from the album, the standard 12-bar of “I’m Your Man,” and the old-school style of the moving “Such a Good Man,” which includes a soulful sax solo. Vocally and instrumentally, Dwayne shows his sweet side on the swaying “Such a Good Man,” a highlight of the album for those who enjoy zydeco at its most gentle. “Zydeco is blues,” Dwayne definitively states. “Zydeco is a little bit like old rock ’n’ roll, like Little Richard and Jerry Lee Lewis—it’s blues-based. 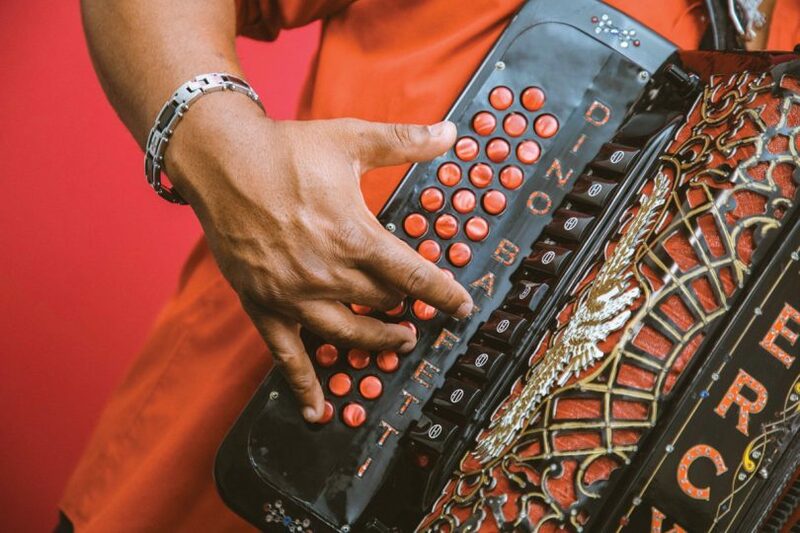 “A little more aggressive” is certainly an understatement coming from one of the fiercest zydeco musicians, accordionists, and performers to ever hit a stage. “The button is always on,” admits Dwayne who, since his youth, has been relentless in his pursuit of the music that was lovingly handed down to him from his father, the brilliant Rockin’ Dopsie. When you first see the man, Dwayne Dopsie’s commanding presence might at first make him appear furiously hip—and he is. Yet underlying his often breakneck flurry of notes, and a philosophy that he and the band should play “like there’s a pit bull chasing us,” he keeps zydeco’s tradition, the love of his life, close to his heart.